With a family-friendly beach on the doorstep and the excitement and glamour of St Tropez just 5km away, the luxury camping site of Marina Paradise offers enticing possibilities for both fun and relaxation. Why stay at Marina Paradise Campsite? Well, why should the rich and famous have it all to themselves? Come and discover this iconic stretch of wondrous coastline from the convenience and comfort of a LUX-camp mobile home. Situated amongst lush greenery, with the tranquil harbour of Cogolin as neighbour, embark on a camping holiday fit for a star! The large heated pool is free of any frills, making the pool area a peaceful place for a swim or for lazing in the sunshine. In the shallow children’s pool, kids can slide down the elephant’s trunk or enjoy some fun and games with inflatable toys. There are archery classes twice a week, plus aqua fitness, sports tournaments and organised events and activities for children and adults alike during high season. The sandy children’s play area includes huge bouncy inflatables and colourful slides. Adults have a multi-sports area at their disposal, plus tennis, basketball, football, table tennis and boules. Hiring a bicycle is the ideal way to get around, with Port Cogolin and the beach so close by. The soft golden sand and calm azure waters of Plage de la Marina de Cogolin make it the perfect spot for a family day at the beach. 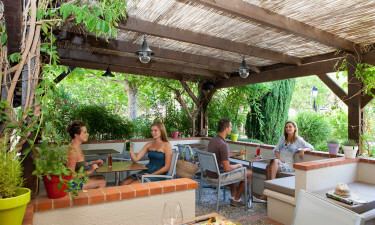 Pack a picnic or head in to Port Cogolin for lunch at one of the restaurants in the marina. 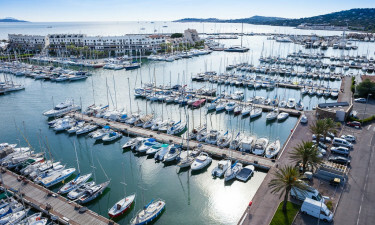 Port Cogolin and the neighbouring Port Grimaud offer a wide choice of water sports, with nautical centres providing lessons and equipment hire for adventures at sea. Pedalo and jet ski rental, diving, windsurfing, kayaking and sailing; there’s no shortage of options. Built on a lagoon, Port Grimaud is not just a haven for water sport lovers. Known as Little Venice due to the network of canals, its charming waterside restaurants, bars and cafes make it an enchanting place for lunch. It also hosts a lively market twice a week. No trip to the Riviera would be complete without visiting St Tropez. Despite its glitzy reputation as a playground of the rich and famous, it has managed to hold on to its charm. Built for fishing boats, the lovely harbour is fortunately too small for the super yachts which anchor off the famous Pampelonne beach. 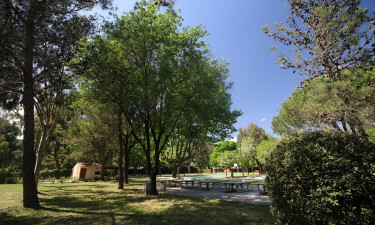 The holiday camping site has a restaurant with terrace, a snack bar, pizzeria and bar/café. The restaurant is only open during the high season, while all other eating facilities are also open during the low season. A small grocery caters to your immediate luxury camping needs, in addition to a souvenir shop on site that offers plenty of reminders to take home. There are plenty of shops in Port Cogolin, not far from the site.